Something big is happening in the world of women’s sport and it feels like we’re on the dawn of a Golden Era. Boundaries are being pushed, roles are being redefined and the status quo is being challenged. The media is engaged and, more importantly, brands are starting to realise that women don’t just dominate consumer purchasing, they are the main decision makers! Working in partnership with Strathclyde Sirens, Scotland’s only national women’s sports team playing in a UK wide televised League, your brand can harness the passion of sport to target a highly valuable market whilst driving real, meaningful impact for a strong ROI. With UK wide reach and a range of Partnership opportunities to activate, Strathclyde Sirens presents an exciting proposition for brands to work with. Contact Jessica, Marketing Manager at marketing@sirensnetball.com for more information. Clyde 1 is the number 1 commercial radio station across Glasgow & the West. It is also home to Scotland’s biggest commercial breakfast show – Bowie@Breakfast – with the legend that is George Bowie. The station delivers the perfect mix of music from the last 15 years, combined with George and the other presenters brilliant Glasgow chat, fantastic competitions and features like the £5K Minute, Make Your Dad (or Mum) Mad, Kool Ride To School, McGhees Wall Of Fame and much more. Add in the likes of Clyde 1 Superscoreboard, GBX, Ewen and Cat, local news, sport, travel and weather updates and don’t need to listen anywhere else. Listen to Clyde 1 on FM, online, DAB radio and via the Radio Clyde App. Since 1990 Woosh have provided their experienced team of announcers and djs at many sports including football, rugby, basketball, beach volleyball, tennis, triathlons, athletics, curling, netball, cycling, snooker and adventure racing. EventScotland - working to make Scotland the perfect stage for events. Through funding and developing an exciting portfolio of sporting and cultural events EventScotland is helping to raise Scotland’s international profile and boost the economy by attracting more visitors. Newcode UK is a Glasgow based customer oriented digital solutions company, handling all business needs from Graphic & Web design, Web & Mobile App Development, Cloud Services, Branding and Digital Marketing. University of the West of Scotland (UWS) is one of Scotland’s largest modern universities, with four campuses in the west of Scotland (in Ayr, Dumfries, Hamilton and Paisley) and a fifth campus in the heart of London, launched in September 2015 to open up UWS learning and teaching opportunities to new markets. With origins dating back to 1897, UWS has a proud record in delivering work-ready graduates through applied research and career-focused study options, and partnerships with business, industry and the public and voluntary sectors. Netball Scotland is responsible for promoting, organising and developing netball in Scotland from ‘grass roots’ to elite level. They have more than 5,000 registered members and an estimated 20,000 participants in Scottish schools. Netball Scotland also provides opportunities for talented athletes, coaches and umpires on the world stage based upon a strong presence in international netball through membership of Netball Europe (NE), the International Netball Federation (INF), and the Commonwealth Games Council for Scotland (CGCS). At the heart of everything they do is their vision: to inspire Glasgow’s citizens and visitors to lead richer and more active lives through culture and sport. Glasgow is Scotland’s largest, busiest and friendliest city, Glasgow Life in partnership with Glasgow City Council believe they can make it even better. They believe that greater access to cultural, sporting and learning activities can help the city – and its citizens – to thrive. Their purpose is to provide Glasgow’s residents and visitors with that greater access; to deliver better cultural, sporting and learning services and opportunities and inspire everyone to make the most of them. In doing so they aim to make a positive impact on individuals, the communities in which they live and the city as a whole. The Award winning £113m Emirates Arena and Sir Chris Hoy Velodrome is now also the proud Home of the Sirens Vitality Netball Superleague team. Having played host to the World Youth Netball Championships in 2013, the Arena has since then gone on to host many other major International events, including the Davis Cup, the World Cup Gymnastics, International Athletics, and the Badminton Grand Prix. The venue can seat up to 7000 spectators and boasts an International standard velodrome, a 200 metre athletics track and a luxury spa. Viper 10 Sportswear are Netball Kit Specialists. In 2012, Viper 10 was launched with the aim of changing the face of Netball Kit in the UK with vibrant, stylish and outrageously unique designs. 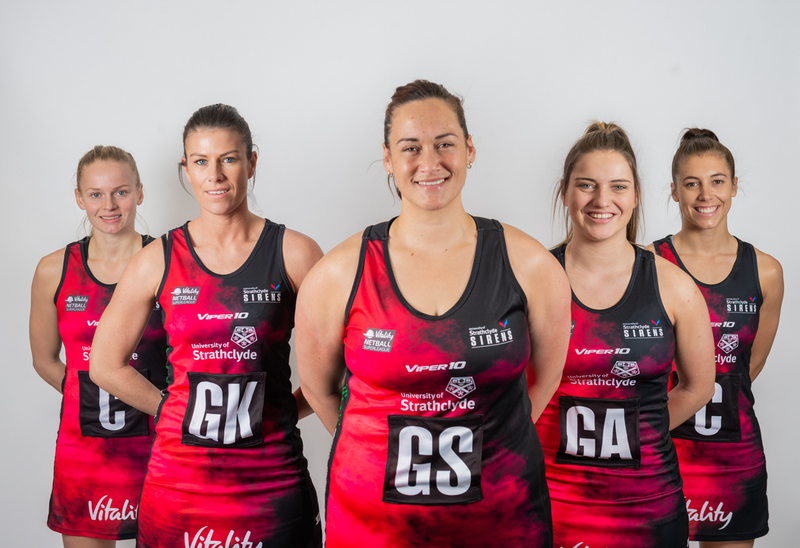 Sirens Netball are the perfect partner for Viper 10 and together we embark on a new journey to change the game. Since launching in 2012 with endorsements from the likes of Lewis Moody MBE (Former England Rugby Captain) and International Netballer Geva Mentor, Viper 10 has built a reputation for high quality products, unrivalled customer service and reliable delivery. The Institute of Sport provides high performance expertise to sport and athletes in Scotland. As the high performance arm of sportscotland, the institute is working with partners to build greater success for Scottish sport. Their objective is Scotland consistently winning on the world stage. In everything they do, they act in the best interests of Scottish sport - putting sport first. Sportscotland is the national agency for sport. They are the lead agency for the development of sport and have a clear focus on building a world class sporting system for everyone in Scotland. They are a non-departmental public body, responsible through ministers to the Scottish Parliament. They invest Scottish Government and National Lottery resources to build a world class sporting system for everyone in Scotland.